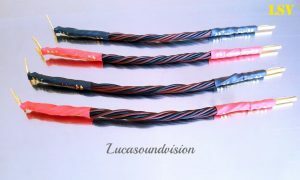 4 x cm (A Pair) Van Den Hul-SKYLINE Hybrid Speaker Jumpers Cables Terminated. Professional Terminated banana Z-Type 4mm Plugs,other end standard 8mm (width of opening) SPADE Connectors. Cables is high pressure crimped of profesional crimping tool AIRLOC HIGH PERFORMANCE TERMINATION (for maximum contact surface area). 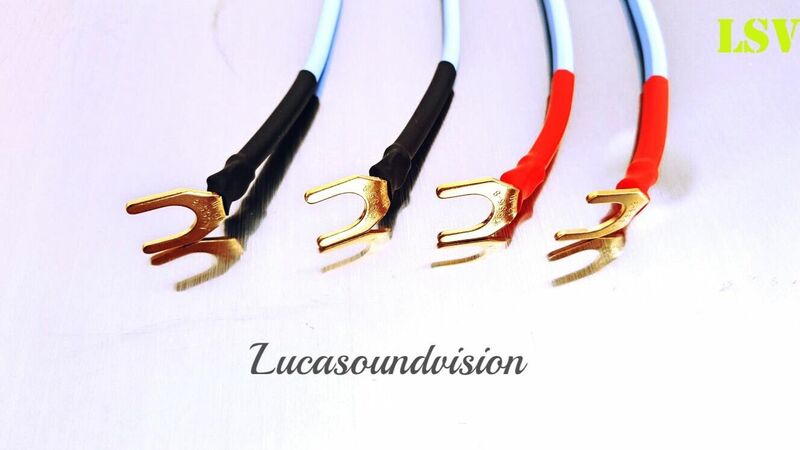 Terminated high quality 24 gold-plated banana plugs Z-Type with extra crimped pin section, other end high quality 24 gold-plated SPADE Connectors. The ends finished with colour coded Red & Black heat shrinks. Well, almost all speakers come with standard grade copper jumpers (bare rails). 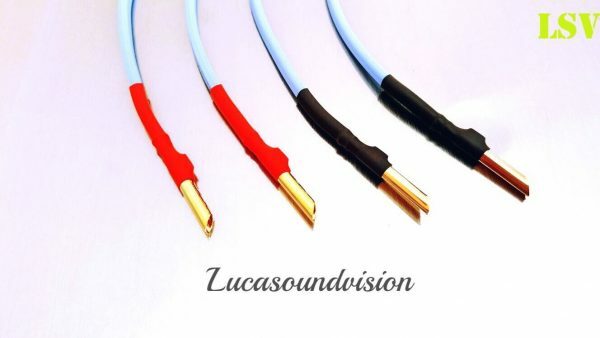 For a quick and effective upgrade to your bi-wirable speakers simply remove the standard connectors bare rails and affix ours for instant VDH. Also available Terminated with Milty spring 4mm Banana Airloc plugs. Van Den Hul Speaker Cables also available. 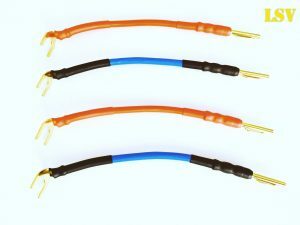 The SKYLINE HYBRID is a low priced member of our AWG 14 twin-lead loudspeaker cable range which consists of The GOLDWATER, The CLEARWATER, The BRIDGE, The SNOWLINE, The CLEARLINE and The SKYLINE HYBRID. The SKYLINE HYBRID is the only Hybrid cable in this range: Each lead combines 19 high purity Oxygen Free Copper strands with a coating containing our Linear Structured Carbon ®. This combination of metal and carbon (hybrid technology) has excellent properties when it comes to resolution and neutrality, and therefore is standard applied in all of our heavier loudspeaker cables. The SKYLINE HYBRID is 8.5 mm wide and 3.4 mm thick. 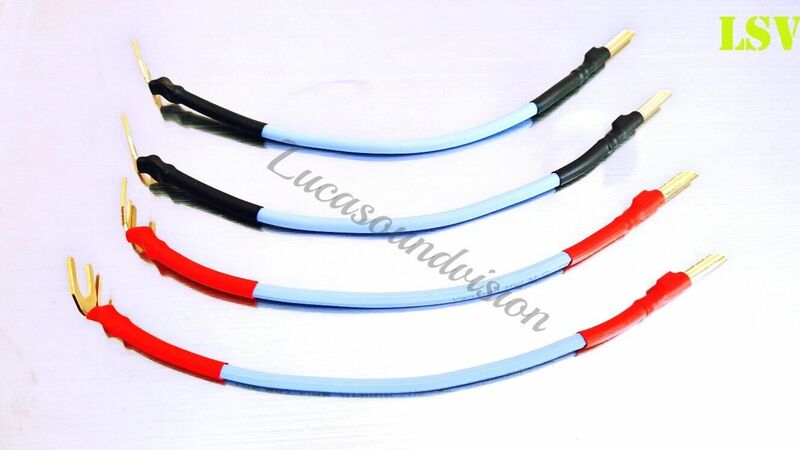 Each of its two 2.04 mm conductors exhibit a resistance of 0.84 Ohm/100 m.
The cable’s jacket is made of sky-blue coloured HULLIFLEX ® 3, a robust halogen free material excellently capable of shielding the copper conductors from the chemically threatening outside world. The cable’s sky-blue colour quite accurately represents its sonic character: as clear as a cloudless blue sky. Hi Dear Watchers.I wanted to add a few words from me. Repeatedly tested my products and reaching for feedback from my clients and I’m certain that the results are better than with the original links and that bi-wiring there is unnecessary and expensive. 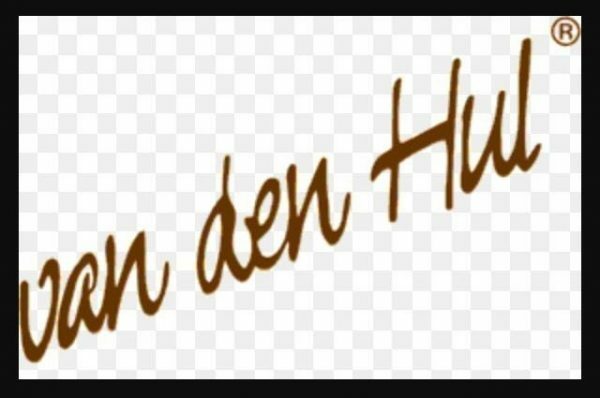 All in all, my customers rate this as a very good value up-grade. 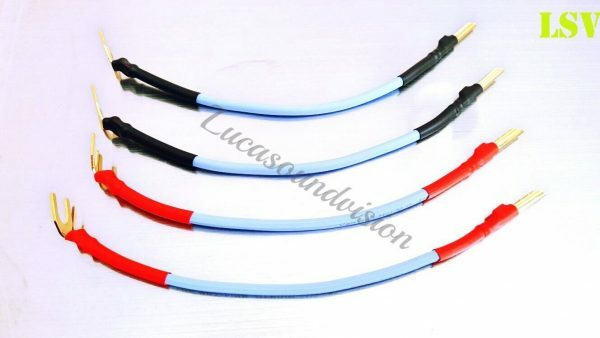 If you would like a different combination of spade to spade connectors, or banana to banana plugs,or different jumpers lengths, please ask. 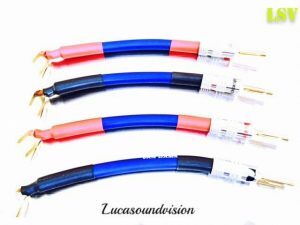 NEW VAN DAMME Professional Black Series SPEAKERS JUMPER CABLES x4 (2 Pairs).